The people, families, communities, and country are always changing. Development is a change which brings improvement in the lives of every human being. The change that benefits only men or city dwellers does not represent development. Thus, a true development benefits all the people and has the capacity to run smoothly for a long time. The level of development is not equal everywhere. Some countries such as those in Western Europe have been developing rapidly for 200 years. These countries are now considered as developed countries. Although there are poor people, most people enjoy the high standard of living. Other countries, mainly Africa, Asia and South America have only been developing for about 50 years and for historical or geographical reasons these developing nations are much poorer. In these countries average living standard of people is low. Development is often connected with economic growth. In this sense, to obtain higher economic status is development. But economic growth alone does not represent true development. In other words, development is concerned not merely with the fulfillment of physical needs of people but also with socio-cultural amelioration. So, true development refers to the changes that improve the overall human condition. 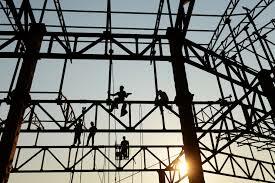 Development takes place with the proper utilization of available means and resources. Factors such as health, education, transport and communication are essentials for providing services for people and to run developmental activities. So these are called infrastructures of development. A country with good systems of these factors can run development easily. Development is a change which brings improvement in the lives of everyone living in the country. Above all good leadership and its execution cannot be expected from corrupt leaders. The level of development can be measured and compared with the help of several figures known as indicators. Gross domestic product (GDP), a common indicator, is the total value of goods produced and services provided within a country's border irrespective of nationalities of the producers or providers. GDP, thus, includes the contribution by the non-nationals within the country but executes that by the nationals abroad. Nowadays gross national income (GNI) is used as the main indicator of economic development. GNI includes both GDP and earning from abroad. If we divide it by total population, we have the per capita income, which is the average amount earned by the people in one year. Per capita income is a common indicator of development. It shows the average income status of citizens in a year time. The distribution of jobs is another indicator. In poor countries, people work hard mainly in non-industrial fields, but without skills, power or machinery, they cannot earn very much. 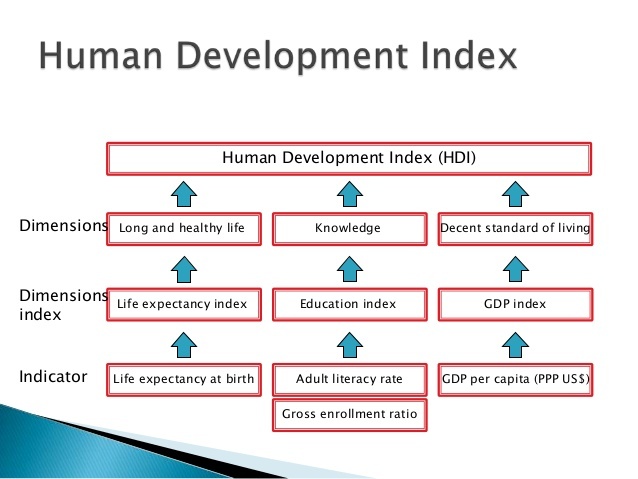 Human Development Index (HDI) is a collective indicator calculated on the basis of per capita income, literacy and life expectancy. So, it can reflect the overall status of development achieved by a country in the areas of economic growth, education, and health. But average values always hide differences. For example, a country with many poor people may have high per capita income because of the high incomes of some very rich people. Per-capita income is same for rich and poor and for earnings and non-earning. Capital Different kinds of tax, investment, trade and industry. Communication Television, radio, satellite, fax, postal services, email, telephone, etc. Education School, technical education, universities, campuses, skill-training etc. Health, sanitation and family planning Healthy and planned family, controlled population, hospital, environment conservation and waste disposal etc. Power Hydroelectricity, gas and oil supply, nuclear energy, thermal power, solar power and fuel etc. Commerce Banking system, insurance, shops and hotels etc. Irrigation Canals, tube wells, pumps etc. Housing, leisure facilities Planned development, government provision. Development is a change which brings improvement in the lives of every human being living. Gross domestic product (GDP), a common indicator, is the total value of goods produced and services provided within a country’s border irrespective of nationalities of the producers or providers. Gross national income(GNI) includes both GDP and earning from abroad. What is per capita income? Why do you think per capita income is expressed in US dollars? Per capita income, also known as income per person, is the mean income of people in a country or a city. It is calculated by measuring all sources of income in the aggregate and dividing it by total population. Per capital income is expressed in US dollar as it is widely known, easily calculated from readily-available GDP and population estimates, and is accepted all over the world. How is GNI different from GDP? Explain with examples. 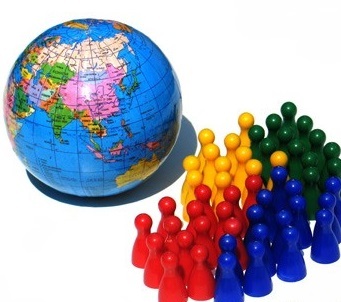 GNI is used as a main indicator of economic development. GDP is used as a common indicator of economic development. The full form of GNI is Gross National Income. The full form of GDP is Gross Domestic Product. GNI includes both GDP and earning from abroad. GDP includes the contribution by the non-national within the country but exclude that by the nations abroad. What are the main features of a capitalist economy? It is an economic system in which an individual in his capacity as a consumer, producer and resource owner is engaged in economic activity with a great degree of economic freedom. The production factors are privately owned and managed by the individuals. Competition is the most important feature of capitalist economy. This means the existence of large number of buyers and sellers in the market who are motivated by their self-interest but cannot influence market decisions by their individual actions. why is there provision for the amendment of the constitution in the interim constitution of Nepal-2063? what is the formation of administration of nepal? The full form of GDP is ______. The full form of GNI is ______. The positive change that improves the quality of life of people is called______. Per capital income = ______. The total value of goods produced within a countries border is known as ______.